By: University President Scott R. Pilarz, S.J. For us as a church, this is a time for mourning, for atonement and deep reflection. Text of the homily given by University President Scott R. Pilarz, S.J., at the Mass of the Holy Spirit on Sept. 6, 2018. Wisdom. Understanding. Counsel. Fortitude. Knowledge. Piety. Fear the Lord. For those of us of a certain age, we will remember being taught that these are the gifts that come from the Holy Spirit. Wisdom is right judgment about divine things and the ability to direct human affairs according to divine truth. Understanding means penetrating insight into the very heart of things, especially those higher truths that are necessary for the good life. Counsel allows us to be directed by God in matters necessary for love. Fortitude denotes a firmness of mind in doing good particularly when it is difficult or dangerous to do so. Knowledge is the ability to judge correctly in matters of faith and right action. Piety is principally loving and revering God with the affection of a daughter or son. Fear of God is not servile trembling whereby we ward off punishment but rather reverence for God and the desire never to separate ourselves from God. I honestly don’t know if these same gifts of the spirit are taught systematically in Catholic grade schools high schools or catechism classes. I don’t know how many of our students have committed them to memory. But in thinking of our current context, the time and place we find ourselves in the life of the church, we need these gifts of the Holy Spirit now more than ever. So much has been said and written in recent weeks about the state of the church. I am no theologian nor am I a social scientist, so my ability to analyze the root causes of our current pain and problems is limited. I am no more an expert on the state of the church than any of you. I am, however, in Jesuit terminology, “the director of the work” so I feel compelled to offer some direction albeit unsophisticated a work in progress. Any further direction requires all of us to work together. I am, like so many members of our faculty, staff and administration, what’s called a cradle Catholic, born to Catholic parents and grandparents. The first 18 years could aptly and literally be described as parochial. I suspect that’s true for many of us as well. My life and the life of my family centered around our parish church and our Catholic elementary school. School and church touched every aspect of our lives, classes we took to the sports we played. Looking back it was the very locus of my parents' social life. My parents’ lifelong friends were all members St. Cecelia’s parish in Pennsauken, New Jersey. I look back with fondness and nostalgia on those days at St. Cecelia’s. Unlike some, I have no horror stories to tell and for many years I took my experience of church and school very much for granted. Moreover, I assumed my experiences were normative. I now know as all of us do that they were not. For many they were foreign and far from normative. While I had no personal experience of suffering the in the Catholic world in which I lived and learned, I know now that for many others church and school were places fear and sources of lifelong pain. Today and together, at the start of a new school year, we need to acknowledge the fear and pain of our sisters and brothers who suffered because of the church and its leaders. It would be wrong to be distracted by the newness of a school year and the activities in which we immerse ourselves. It would be wrong as well to move too quickly to find facile solutions to a set of problems rooted in the very mystery of evil. We need to pray and pray hard for healing and forgiveness. As the book of Ecclesiastes reminds us, for everything there is a season. For us as a church, this is a time for mourning, for atonement and deep reflection. These are not the words I would like to have used to welcome you to a new academic year, but I must. As you know, our University has taken some actions to acknowledge and address the problems of the past. These actions are essentially symbolic more than substance. While I don’t diminish their significance and the wise counsel I received from many members of the university community and our Board of Trustees, I believe there is much more work to be done. Work that we can do for the church as a university. We need to begin by praying for those gifts of the Holy Spirit. Wisdom. Understanding. Counsel. Fortitude. Knowledge. Piety. Fear of the Lord. 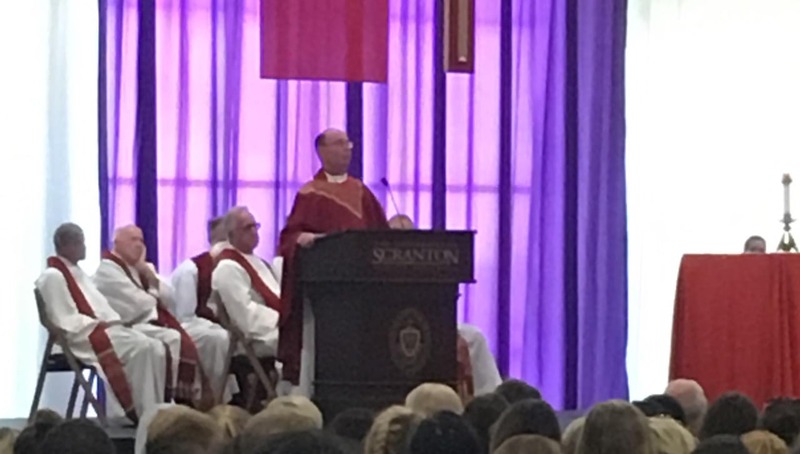 The Mass of the Holy Spirit is an ancient and time-honored tradition here at the University of Scranton and throughout the world of Catholic education. I’ve been part of a Catholic school community since 1964, so I’ve started every school year by attending the Mass of the Holy Spirit. This year, however, feels very different. This year we don’t simply need the spirit’s inspiration to help us study, teach, and create new knowledge. We need the Spirit’s inspiration to sustain us in this most difficult of moments. Moreover, we need the Spirit’s inspiration to help us seek and find a possible and plausible future for ourselves, our university and our church. “I often use a handy metaphor to explain to my students how feminists have historically differed among themselves in their approaches to bringing about change in patriarchal institutions. Some feminists seek a place at the table; others want to reset the table. The former hope to promote gradual progress from within an existing framework of norms and organizational structures; the latter demand nothing less than radical, wholesale reform. When it comes to the Roman Catholic Church, I have always been a “place at the table” kind of feminist. When asked how to integrate women more fully into the life of the church, I offer reasonable strategies. Bishops could, for example, recognize that the call for leadership might flow as much from the sacrament of baptism as from that of ordination, and appoint more women to leadership positions at all levels of church governance. I urge us, together, to think about how we would reset the table. Our prayer today and in the days ahead should move us to make a difference in the life of the University and the life of the church. In addition to renaming buildings and rescinding degrees, the University’s Board of Trustees has committed significant resources in finding a way forward. Neither I nor any other individual on this campus can chart the path toward healing and hope. Collectively, however, I am confident that we have much to offer one another on campus and the many people feeling pain in the diocese we call home and beyond. We have personal, spiritual, pastoral and academic resources that we can put at the service of the church in new and profound ways. We can do this if we earnestly ask for the gifts of the Holy Spirit. In short order, I will invite members of our campus community from a wide variety of constituencies to come together to imagine and plan how we can respond, in ways both simple and sophisticated, to the needs of God’s people in this painful moment. I don’t mean to suggest that we can solve the many complicated problems that plague the church, but I don’t see this Mass of the Holy Spirit as simply a passive pleading for divine inspiration. I see it as a call to action, action rooted always in contemplation. As you know, Jesuits those who share the Ignatian charism and by that I mean all of us, we are called to be contemplatives in action. I think this call is more urgent now than ever on the campus of a Catholic and Jesuit university. Our prayer today and in the days ahead should move us to make a difference in the life of the University and the life of the church. We acknowledge today and every day that God blesses us at Scranton with wonderful comrades and collaborators. “Together we organize the world for ourselves or at least we organize our understanding of it; we reflected, refracted, criticized, grieve over its savagery and help each other to discern amidst the gathering dark, paths of resistance, pockets of peace, and places from whence hope may be plausibly expected.” From such “a net of souls” gathered on this campus human life can spring anew. Holding fast to one another and to our hope and faith in God let the work begin. Work done with wisdom, understanding, counsel, fortitude, knowledge, piety, fear of the Lord. With greater urgency than ever let us pray, Come Holy Spirit and fill the hearts of your faithful people.